Washington, D.C. - Today the Antitrust Subcommittee of the U.S. House Judiciary Committee is holding a hearing on the proposed merger between T-Mobile and Sprint. Milwaukee-area Representative and Subcommittee Ranking Member James Sensenbrenner is among the Members of Congress expected to take part in the hearing this afternoon. Ahead of the hearing, concerns are growing that the proposed merger fails the public interest test and would raise prices on consumers and eliminate jobs for workers, while failing to deliver on promises for rural America. Comprehensive economic analysis from the Communications Workers of America (CWA) shows that the merger will result the loss of 30,000 U.S. jobs - 25,500 from the closure of overlapping retail stores and 4,500 at headquarters. This includes 226 jobs eliminated in metro Milwaukee, part of 394 lost jobs from 108 store closures statewide in Wisconsin. 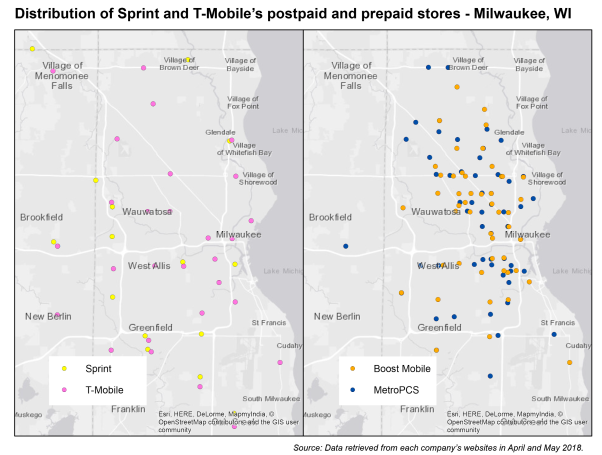 The below map shows the location of existing Milwaukee area T-Mobile and Sprint retail stores, including prepaid Boost Mobile and Metro by T-Mobile stores.